The new ProVec Version 4 offers colour recognition in the conversion of raster images. A NEW version of the raster to vector conversion software ProVec is now available with colour recognition technology, at a cost comparable with programs that only vectorise in black and white. 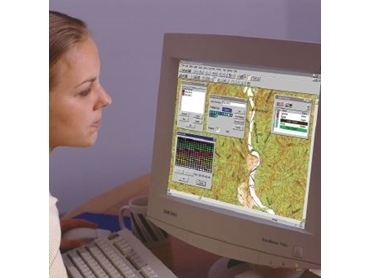 Developed in Australia by the Spatial Division of Sinclair Knight Merz , ProVec is designed to convert standard raster or bitmap-scanned engineering, mining, geological and architectural drawings, and geographic information, to vector formats suitable for use in CAD and GIS applications. Operating on a variety of scanners and input devices, earlier versions of ProVec have been in use for more than a decade. The new ProVec Version 4 retains all the best features of the earlier black and white versions, including an easy-to-use graphical interface, OCR, layer separation, a preview facility, a parameter assistant, powerful raster editing, and batch processing. It adds an expanded range of input and output format handling capabilities, greyscale, and 8 and 24 bit colour functionalities including colour reduction, colour separation into layers for vectorisation, and palette manipulation. Provec Version 4 also provides an intelligent mechanism for extracting features of interest - such as contour lines, roads, fences and pipelines - for vectorisation. Input raster formats include CALS, TIFF (Group 3 and 4, uncompressed and Packbits), PCX, RLC, Intergraph RLE and CIT. Output vector formats include AutoCAD (DXF, ASCII and Binary), MicroStation (DGN), ARC/INFO and MapInfo (MIF/MID). The versatile preview facility, carried over from earlier versions, can display vectors superimposed on the original raster image and saves considerable time by enabling users to preview results before committing to full vectorisation. ProVec 4 is available as a stand-alone product to run on Windows 95, 98, NT, 2000, ME and XP. Bundled with the DesKan Express large-format scanner, also marketed by Sinclair Knight Merz, ProVec 4 offers a 'one-stop scanning and vectorising shop' for converting paper-based documents up to A0 into digital images. Sinclair Knight Merz 07 3244 7394.